Despite airing on a Monday instead of a Sunday for the first time since 1976, NBC’s Emmy telecast came up a pretty big winner in the national Nielsen ratings. The three-hour ceremony, hosted by Seth Meyers, weighed in at 15.6 million viewers. That put it well behind last year’s total of 17.8 million, although there were extenuating circumstances. CBS’ 2013 telecast aired on Sunday, Sept. 22nd and benefited from a big lead-in audience from the network’s preceding NFL game between the New York Jets and Buffalo Bills. The traditional broadcast networks held their own this time out, especially when compared to last year. Although host NBC and Fox were shut out, CBS, PBS and ABC combined for 11 major Emmys while the cable networks had 14. In the 2013 Emmys, cable and Netflix led the broadcasters by a score of 19 to 6. 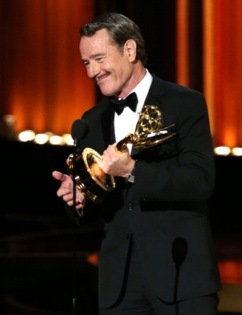 AMC’s Breaking Bad, with a major finishing flourish, led all individual shows with five Emmys. ABC’s Modern Family (named best comedy for the fifth straight year) and PBS’ Sherlock: His Last Vow, tied for second with three apiece. CBS, AMC and FX tied for the most network wins with five each while HBO dropped from a leading 7 last year to just 3 this year. Matthew McConaughey of HBO’s True Detective felt the sting, losing for the first time in any of this year’s awards ceremonies. The best actor in a drama series Emmy instead went to Bryan Crantson for Breaking Bad, which also repeated as TV’s best drama in the final award presentation of the night. My cnn.com commentary on Monday’s Emmy Awards can be found right here.